Time This is a digest of this. An SI second is defined in terms of ceasium. UT1 and UTC track the Earth’s rotation. UTC is a time in which a second is an SI second. UT1 tries to keep closer to the real rotation. |UT1UTC| < 0.9 seconds. In 1820 UT1 and UTC advanced at the same rate on the average. The Earth is slowing. To avoid long term drift UTC jumps back by one second once a quater as needed. This is a good intro too. 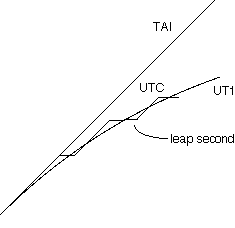 TAI is like UTC but omits leap seconds. It was the same in 1958. GPS uses SI seconds and does not leap and is defined relative to UTC. TAI = GPS + 19 seconds.